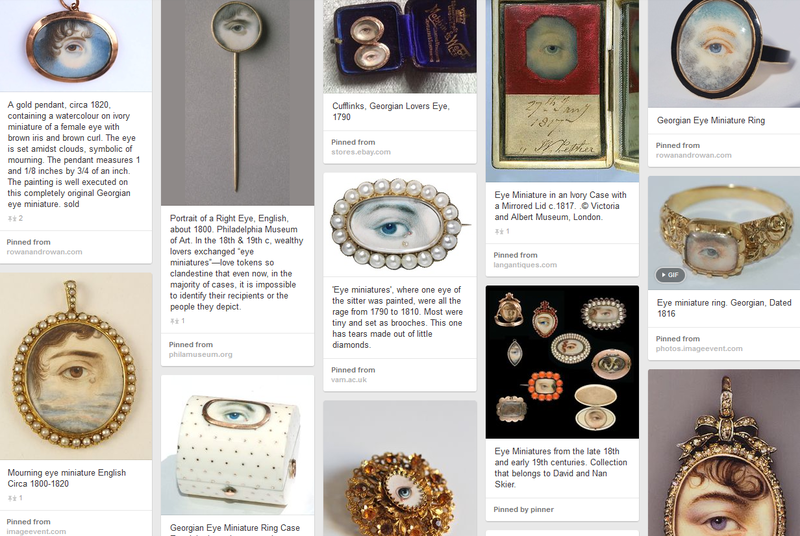 Having read yesterday’s post,friend, Bob Nelson, sent me a link-up to the Smithsonian Portrait Collection, and as a result, I learned about the miniature eye portraits that were in vogue in the late 1700s and 1800s, gifts shared between dear friends, lovers or family members. I find this entire concept endearing and would give anything to own one of these beauties. Just to let you know, I found one on eBay auction and they are hoping for a bid of 3600.00. A little out of reach! Be aware that since learning about these gems, there are many replicas being created, but being sold at ridiculous prices. Buyer, beware! In the 18th and 19th centuries, well-to-do lovers exchanged ‘eye miniatures’ – love tokens so clandestine that even now it is almost impossible to identify their recipients or the people they depict. They were meant to be worn inside the lapel, near the heart. Not wanting to visit the link? This is a must-read. Suddenly popular, this unusual type of portraiture soon appeared in a variety of settings. Rendered in watercolor on ivory, or sometimes in gouache on board, ad vivum eye portraits were mounted in pins or in brooches encrusted with half pearls or brilliants, set in rings or gold bracelet clasps, or framed on the lids of snuffboxes, toothpick cases, dance programs, book covers, and other containers (Fig. 3).6 Lockets adorned with eye portraits, like those holding portrait miniatures, sometimes contained neatly braided or woven hair with ciphers behind crystal or glass. Participating in the same economy of gift giving as sentimental jewelry, these trinkets were exchanged between lovers, friends, and relatives. In addition, as evident from inscriptions on the reverse side of these objects, many eye portraits mounted in jewelry were worn in memory of deceased loved ones. Records show that entire families had their eyes painted, though it remains unclear as to how the portraits were distributed among various family members. I can hardly wait to share these with the artists of East Village. They are remarkable…makes me want to paint one for someone! Pinterest has no shortage of featured images…I’m posting two here. 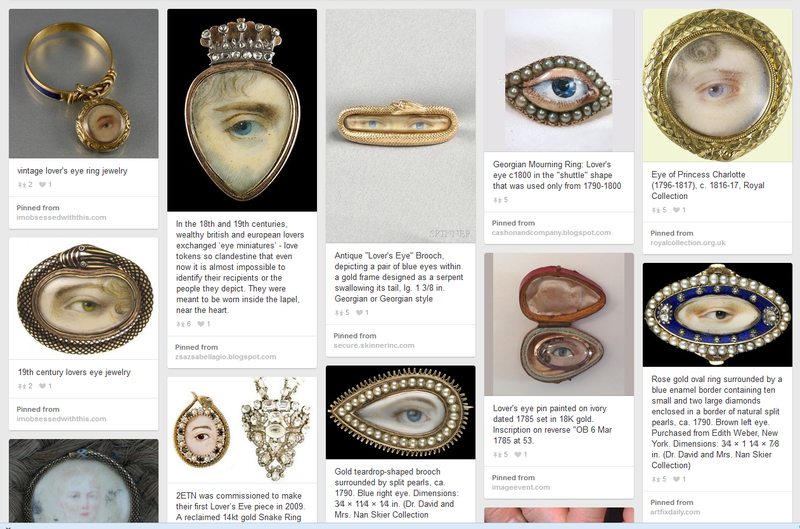 Another snap from Pinterest: Eye Portraits. This entry was posted in Creativity, Fine Arts, Going Somewhere?, Painting, Reflection and tagged Billy Idol, Eyes, Georgian Jewelry, Miniature Eye Portraits, Miniatures, Smithsonian Portrait Gallery by Painter Lady. Bookmark the permalink. Fascinating. I have never heard of this before. Thank you for writing about it.